Like all good structural cakes, there needs to be a sturdy platform. In this lesson Rhianydd talks through how to create and cover the structure. For the central platform refer to the TEMPLATE. 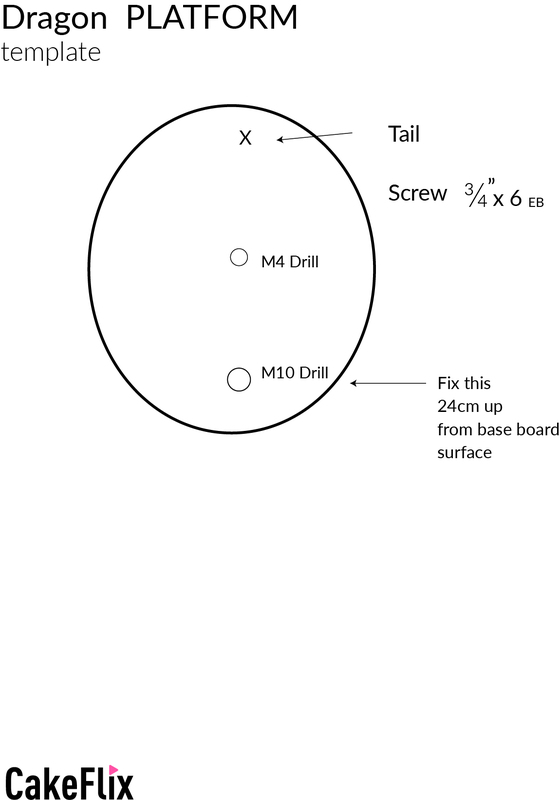 Note that the platform should be set 24cm from the surface of the board to the platform. Time to get the dragon armature ready. In this lesson Rhianydd sets strong wires to the desired shape then tapes them to the structure in preparation for adding the chocolate and cake. In this lesson, it’s a case of choosing the right cake sizes for shapes required, then stacking, carving and ganaching. Rhianydd shares lots of little hints and tips along the way so well worth watching. Time to put your DIY skills to use and start tiling the roof, but its done with a twist where Rhianydd uses a marble effect before cutting out the tiles. Covering a flagpole neatly can be quite a challenge, but watch how Rhianydd walks you through covering the pole to get that neat, sharp finish. We are starting to add those distinctive dragon features now when we add the chest plate. Watch for a nifty technique that Rhianydd introduces when making the armour plates really stand out. 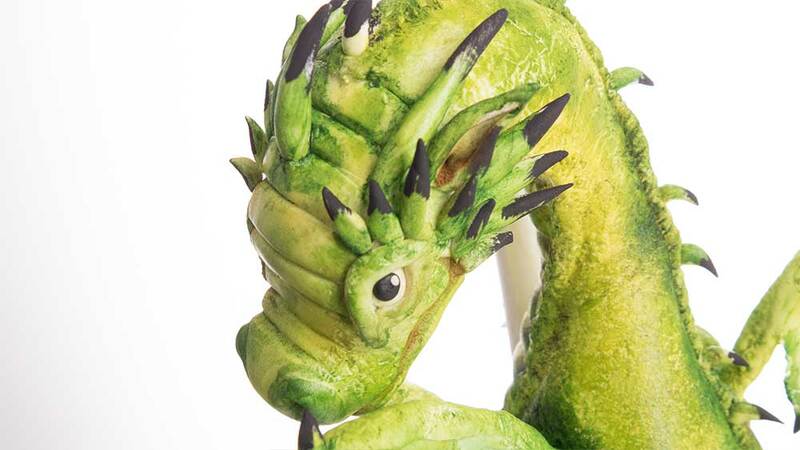 Breaking the complicated dragon’s head down into small little bite sized techniques, Rhianydd creates this amazing dragon’s head. 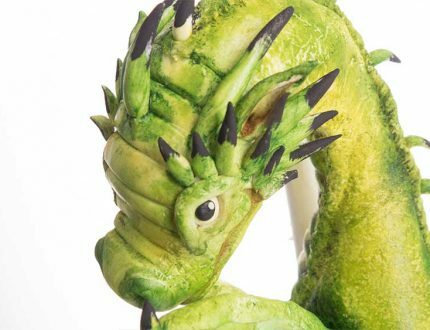 There are so many little parts that go into making this head that you will have the choice to make the dragon’s face cute, angry, funny or naughty (as we’ve gone for here) just by changing some features. Now for the tricky part…covering the body. But first we get the fun of adding our dragon’s tail. 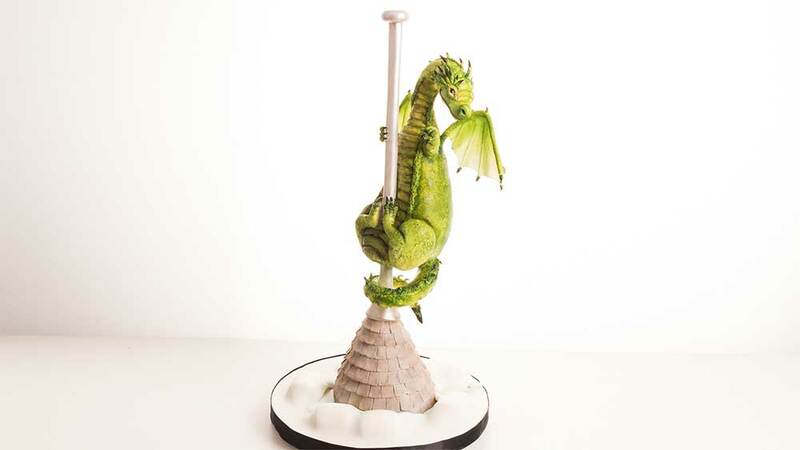 The body is texturised using some great techniques to give the dragon’s skin that distinctive loop and watch the way Rhianydd blends it into the cake. Using some simple, but very effective techniques, in this lesson you will see how Rhianydd adds and texturises the joining panels to make a lovely blend. 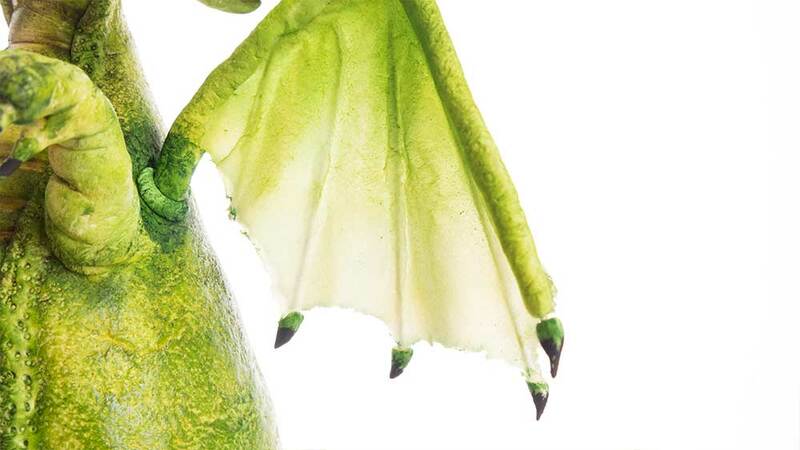 The same technique is applied to add the back spine to the Dragon. No Dragon is complete without a spiny back. In this lesson, you’ll learn how to add and shape the spines. Allowing you to add character to your creation. Creating these very distinctive arms and legs and correctly positioning them, can make all the difference with this cake. 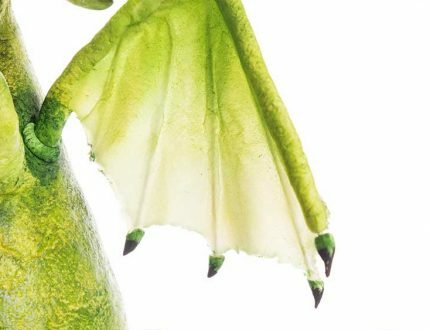 All the details, right down to the little claws and merging into the cake are clearly explained and you’ll be so proud once you see this part all come together. In this lesson, Rhianydd shows how to shape wires to create the structure for the wings before adding and shaping the wafer paper to get the desired shape. To finish the wings she then adds the little spikes and all they need now is some colour! Time to get the airbrush out! 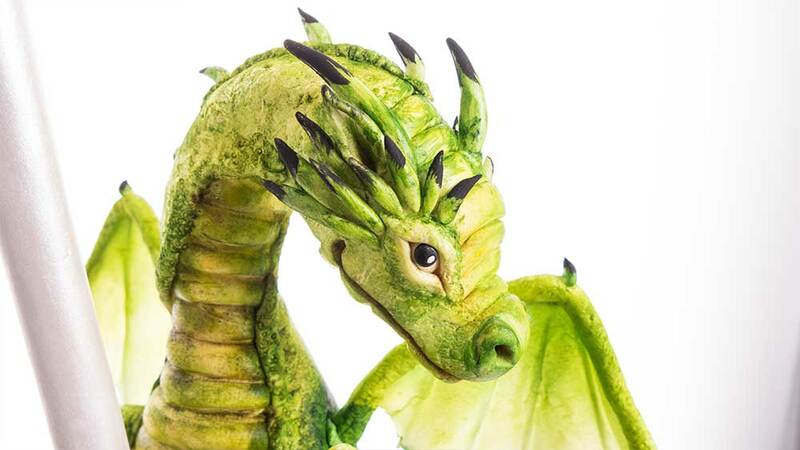 This is when the design really comes to life as the wings get layered in yellow before adding some gentle green to give our Dragon his distinctive colour. Now it’s time to age the roof by colouring the grey sugarpaste tiles. Using the airbrush and a mix of black and brown colours, Rhianydd shows how to create an aged look in no time at all. NOTE: There was an issue with the close up camera in this lesson, we hope that it didn’t spoil your enjoyment too much. 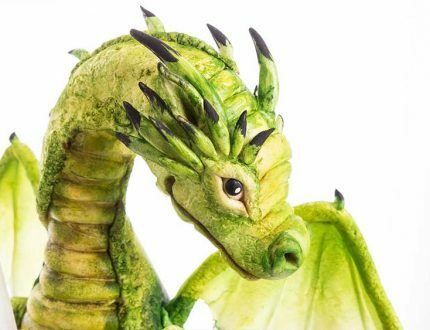 Rhianydd really brings this Dragon to life so follow her simple, but very effective, techniques as she brings the Dragon to life. Down to the final details now where little shades and shadows really start to give this Dragon it’s personality. Rhianydd walks through every stage explaining and showing how to achieve these amazing effects. Now for the final finishing touches where the clouds are added along with some gentle colouring and painting the flagpole to finish off. Rhianydd shares with us some other ideas for this design. Everything a professional cake decorator needs to know for making a design like this. 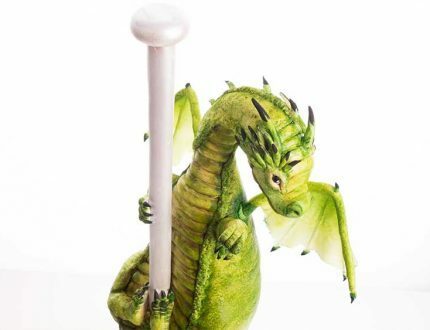 Highlights of our naughty dragon course. 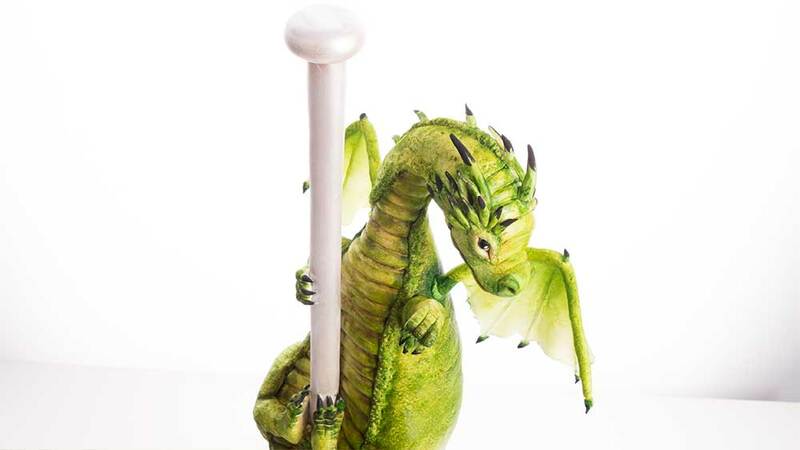 Learn how to make this wonderful Naughty Dragon cake with Rhianydd Webb. A great design for fans of Game of Thrones or anything big and mystical. This design can be personalised in lots of different ways! 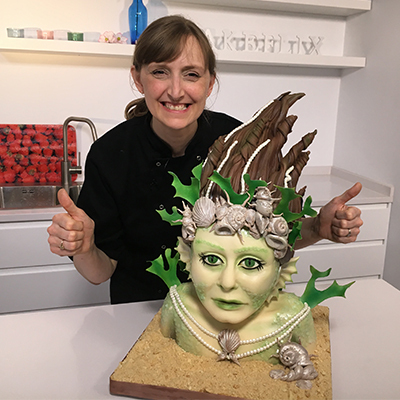 Owner of Dragons and Daffodils cakes in Wales, Rhianydd is a renowned cake decorator who specialises in novelty and wedding cakes. Rhianydd Webb set up Dragons and Daffodils Cakes in July 1999. A home-based business with the lovely Pantygraigwen Community Centre for classes, based near Pontypridd in Wales. Rhianydd started off by learning her trade through books, which were her only source of knowledge and inspiration. 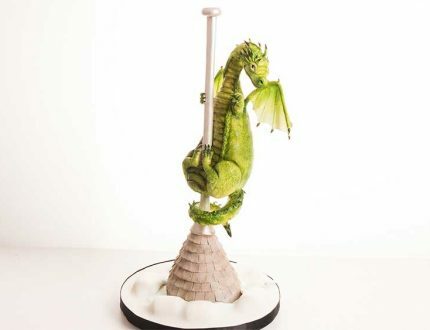 Amongst the key artists that she learned from are Alan Dunn, Tombi Peck, The International Sugarcraft Books, Debbie Brown, Lindy Smith to name just a few. Since then, I have been very lucky to be able to study Intermediate Cake Decoration and Beginners sugar flowers under the very talented Janet Side and received Distinction for both. I have also attended day courses with Alan Dunn, John Costello, Carlos Lischetti, Mary Presicci and Kim Wiltjer.